to bring out the voice of the particular instrument. Everett 'preloaded bracing' (1994 EGC inc.). This gives the guitar a full, balanced, powerful voice. What this means is there is a certain tonal standard that all Everetts have. Below is simply a description of the three body sizes and their inherent tonal differences." 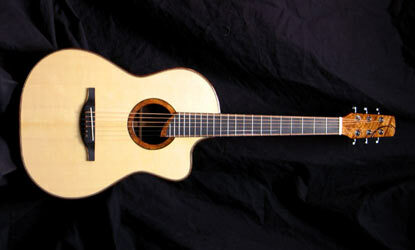 This is the Everett Parlor guitar. A body shpae taken from the Everett Concert Classical guitar. 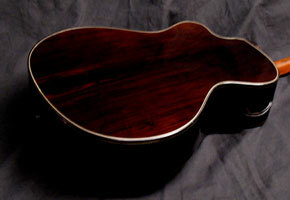 With an even thin guitar side depth making it a very comfortable sitting on the couch guitar. I'm always surprised when I first play a new L-model. They are almost as even and punchy as a P-model but in a grand concert shape. 25.5" for a louder OM sound and feel. This is a very even sounding guitar. It has a rich bass, midrange, and treble. The guitarist is not limited by the instrument's tonal range. It is a bit smaller than a dreadnaught and more comfortable to play both sitting and standing. This is my most popular guitar. The Petite body shape is a modified OO.. The body depth is an even 3.25" - neck to end block. It has a 24.75" scale fingerboard and comes with a 12th or 14th fret body joint. The Petite is a smaller guitar designed for comfort. full soundboard, and tonal voice. a surprisingly big balance rich voice from a small comfortable box. the mouth drop open slightly in surpirse. It sounds a lot larger than it is...."